James Fittler engraved forty-eight Scottish views “from accurate drawings made on the spot” by John Claude Nattes. 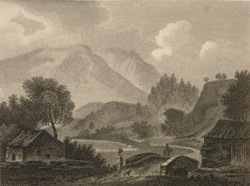 The series was published in 1804 under the title ‘Scotia depicta; or The Antiquities, Castles, Public Buildings, Noblemen and Gentlemen's Seats, Cities, Towns and Picturesque Scenery of Scotland’. Designed to satisfy the appetite of the tourist market, the engravings present a brooding and dramatic interpretation of the landscape that evokes the spirit of Scott’s narratives.